514. A sum of 475000 was invested in Company Q in 1999 for one year. How much more interest would have been earned if the sum was invested in Company P? 515. 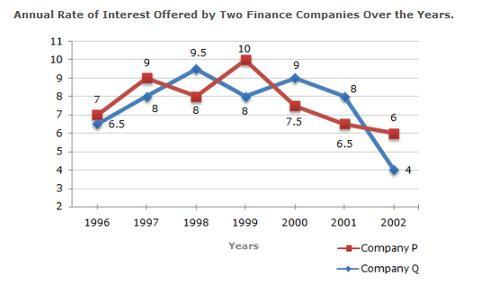 If two different amounts in the ratio 8:9 are invested in Companies P and Q respectively in 2002, then the amounts received after one year as interests from Companies P and Q are respectively in the ratio? 516. In 2000, a part of 3000000 was invested in Company P and the rest was invested in Company Q for one year. The total interest received was 243000 What was the amount invested in Company P? 517. An investor invested a sum of 1200000 in Company P in 1998. The total amount received after one year was re-invested in the same Company for one more year. The total appreciation received by the investor on his investment was? 518. An investor invested 500000 in Company Q in 1996. After one year, the entire amount along with the interest was transferred as investment to Company P in 1997 for one year. What amount will be received from Company P, by the investor?